Ananka's Diary: Curse of the "Crying Boy"
In 1985, an English couple's house caught on fire. Everything on the ground floor was destroyed--with one strange exception. A cheap painting of a crying child had survived the flames unscathed. It was odd, yes. But then a local firefighter stepped forward, and the story became truly disturbing. The firefighter claimed that the tacky painting was well known among his blaze-battling colleagues. It was often discovered--in perfect condition--among the burnt remains of fire-ravaged homes. The "Crying Boy" had been present at dozens of fires, investigators later determined, some dating all the way back to 1973. One of Britain's tabloid papers immediately picked up on the story, and the "Crying Boy" became a phenomenon. Was the painting cursed? Was poor taste in home decor putting people's lives at risk? When the paper offered to destroy people's paintings for free, frightened Brits sent in so many copies that the stack eventually reached over twelve feet high. Of course most "rational" people have long dismissed the curse of the "Crying Boy." The source of each and every fire at which the painting was present has been identified by firefighters--electric heaters left next to beds or stoves left burning unattended. Read the full story at forteantimes.com. Uh.... Thats one creepy looking child. Your right who wuold want to have to see that on there wall everyday. I find it very interesting how the boys parents died in a fire. oh my gosh. See i really don't like stuff like that.I dont even know what to think about that.one quetion.....Do the rest of you believe in it? That is sooo cool! OoO If the fire can't hurt it, can you chop it in half or something? XD But who would chop it in half? Very creepy! I wouldn't want that painting hanging around anywhere in my house! I sorta believe the legend/myth. I think the boy looks more mad than sad though. Oooo. This is very creepy. That is... Really, really creepy. We have one like that, almost, but the 'Crying Boy' in the picture happens to to be my dad as a five year old, getting a splinter removed. So I don't think it counts. sheesh. i'll bet the artist was also the maid who gave robert the doll. she has a thing for creepy little boys. What do you think would happen it you tried to set fire to the painting? This is so creepy. Man, I wish stuff like this would happen out here. All we get is the "2008 Democratic National Convention". Bo-ring! Bookgirl-Try googling "publishing companies". I'm kinda a writer, too, and I found a lot of pretty good ones. My advice, pick like 6 or 7, and if one turns you down, just go to the next one. 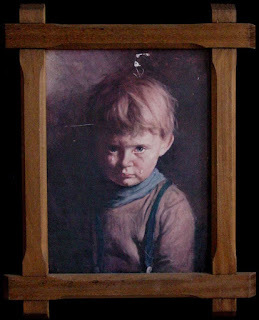 Who would want a painting of a sad child? It's just as bad as having paintings of sad animals (like certain people in a certain book!). Where I live, you have to make things happen. I would love to see your book! Actually, I do believe this. I'm a sucker for ghost stories.